Draper’s predictions, made during a June 12th interview with The Street, come during a rough week for cryptocurrencies in general. With the value of Bitcoin descending almost 10% in just seven days, many market observers — such as CNBC Africa’s Crypto Trader host Ran Neu-Ner — predict further price falls as market sentiment appears to be overwhelmingly bearish. However, Draper has shared a different perspective, following up on extremely bullish calls made in April this year calling for a 2018 end-of-year Bitcoin price of $25,000, with $250,000 in sight within four years. 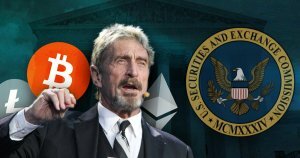 In an interview with The Street, Draper weighed in on the ongoing regulatory debate, which has seen blockchain influencers such as John McAfee call out the SEC directly for taking action that the cryptocurrency community perceives to be outside of the regulatory jurisdiction. Regulation, according to Draper, must be “reined in” and made clear. SEC Chairman Jay Clayton’s recent statement that Bitcoin is the “only” cryptocurrency that is not a security — and that all altcoins and ICOs definitely are — has drawn ire from the cryptocurrency community. Rather than classify cryptocurrencies as securities, Draper would rather see cryptos regulated in a similar manner to currency. The SEC’s position on the regulatory status of cryptocurrency, states Draper, is determined by the limited frame of reference through which the SEC views them — to a knee surgeon, posits Draper, everybody looks like they have a knee problem. This explosion in the popularity of cryptocurrencies, combined with a staggering decline in the prevalence of fiat currencies, states Draper, will see Bitcoin trade around the $250,000 mark by 2022. Draper’s position on Bitcoin places him firmly in the ranks of Bitcoin maximalists such as Fundstrat’s Tom Lee, and crypto evangelist John McAfee, both of whom have made similarly bullish calls in the past. With the US government currently launching a criminal investigation into Bitcoin price manipulation — executed by the 1,000 or so Bitcoin market participants that control over 35% of all BTC, according to a recent analysis – it’s possible that the Bitcoin market could break free from the yoke of constant manipulation and soar beyond the December 2017 all-time high of $20,000 — proving Draper and other Bitcoin bulls right.